Our wildlife foods contain no artificial flavours, colours or added sugar. All of our products are made in Great Britain! You will find them in all good pet shops, garden centres and some on-line retailers. 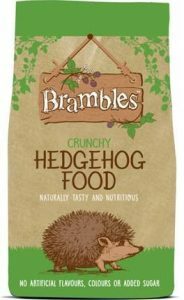 Brambles Crunchy Hedgehog Food consists of small kibbles with poultry as the main ingredient. Available in 900g and 2Kg sizes. 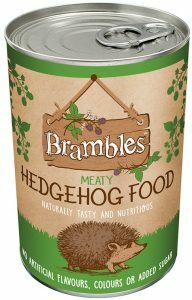 Brambles Meaty Hedgehog Food is a chicken and meat based wet food. It is a complementary food specially formulated to give the right balance of nutrients, vitamins & minerals for wild hedgehogs. Each evening offer about a quarter of a can per hedgehog in a shallow dish, can also be mixed with Brambles Crunchy Hedgehog Food. Always ensure there is a supply of fresh water. 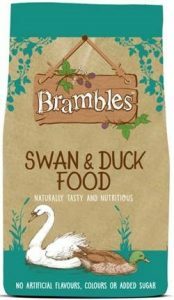 Brambles Swan & Duck Food floats and is crammed with nutritious ingredients including peas, rice, wheat, linseed and fishmeal. It is a complementary food specially formulated to give the right balance of nutrients, vitamins & minerals for swans and ducks. As the food floats, you can see when it is time to stop feeding. Also suitable for geese, moorhens and coots.